As far as I can see, twentieth-century British sculpture was dominated by Barbara Hepworth and Henry Moore and, whilst you would be unlikely to mistake the two, there is a sense of continuity. Both are very organic in form and were committed to sculpture in public spaces. Whilst both did work in bronze and other metals, there is a background in manual carving in wood, marble and so on. The aura of the handcrafted. Bronze, on the other hand, usually requires a foundry and experts in metal. Since the late 1960s there has been the more conceptual — walk as sculpture, glass of water on shelf as sculpture (of a tree). 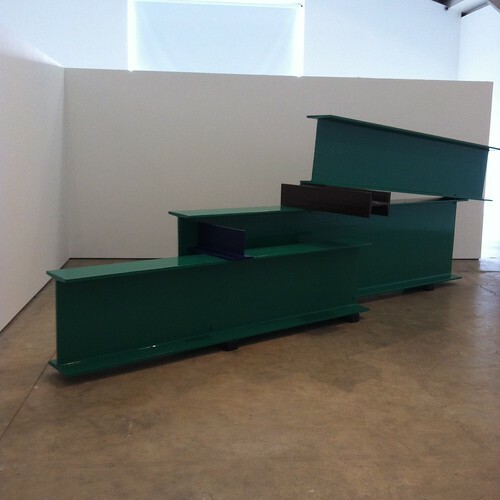 Before this, however, there was Anthony Caro (1924-2013), a generation younger than Moore — and one of his studio assistants. 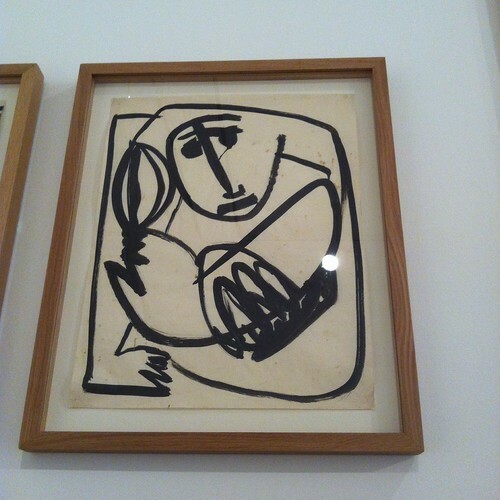 Caro’s early works would involve a hands on roach — lumpy bronzes, a twisted human form and drawings or painting that seem to me reminiscent of Henri Gaudier-Brzeska. 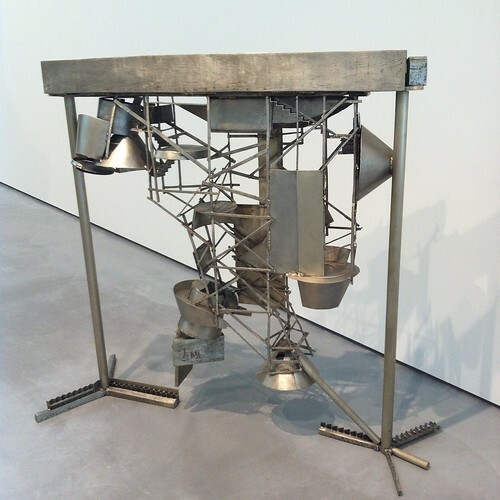 But a trip to the USA in 1959 sent him down a more industrial route — large pieces of metal welded together. Whilst he was to play with bronzed surfaces — rusted, waxed and so forth — the break through works were painted in a limited range of colours. 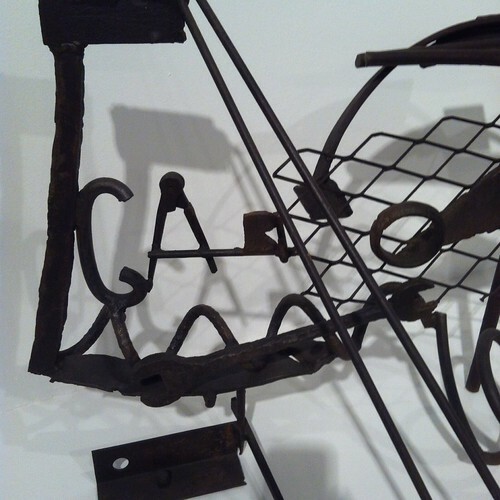 Caro’s work in sculpture brings together painting and architecture, pushing the boundaries. Being metal, being forged, they are clearly solid and heavy, but at the same time they are often suspended or balanced, seemingly lightweight. “They’ve got an inside but they’ve got no centre,” he said of them. His Table Pieces are often suspended on the edge of tables or shelves, and presumably have a very carefully placed centre of gravity. What he is also credited with is the disappearance of the plinth. 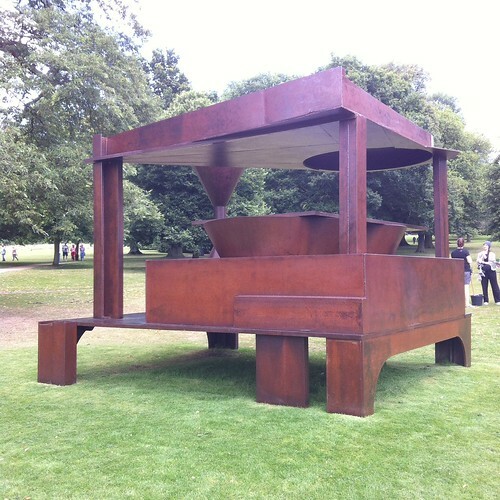 I have a few thoughts about this to follow up, but once a huge lump of metal is placed upon the ground, the frame between world and art is wafer thin. From this comes the possibility of the texture in the grass or a pile of aggregates. 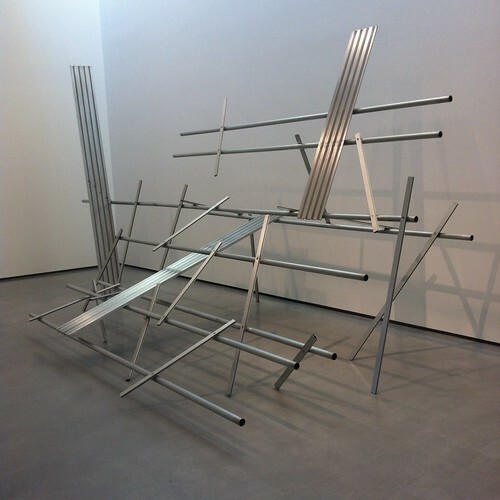 Some of the work looks like a climbing frame or an adventure playground — if the Hepworth and Moore sculptures demand to be felt, than these demand to be climbed. In some cases, the sculptures offer a kind of Wendy house, but mostly there are attendants to stop you. 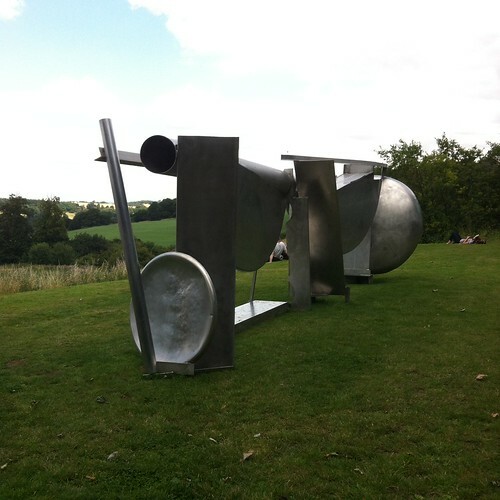 Across one hillside at the Yorkshire Sculpture Park there are a range of different bronzes — curves and planes, verticals and horizontals, holes and towers. Across the other side of the site are the early works, preparatory drawings (and you can see he draws figures like Moore), as well as works from across nearly fifty years. 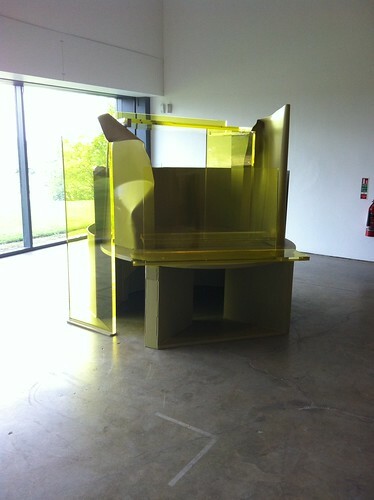 Alongside steel and bronze there is also the use of Perspex — apparently glass turned out to be unwieldy. He also sculpted in paper and plaster imitations of paper. Meanwhile the works at the Hepworth cover the period from the 1960s to his death. I didn’t take a note of the architect, but for a period he tried to codesign a tower; unable to find the funding or whatever, he appropriated the shape as sculpture but turned it upside down. At this point I was reminded of the work of Eduardo Paolozzi, and the mosaic of machinery he explored. I liked these works more than I expected to — there is an aesthetic to them that is pleasing as they balance the solid and the ethereal. There is space and nonspace. And whilst this may end up disappearing the artist, there’s an infection of the real world as art — the scaffolding becomes installation (indeed, Cedric Christie and others have made sculpture from scaffold poles).